Scene from "Facing Fear." Courtesy of UNAFF. Why is mid-October my favorite holiday season? Because the United Nations Association Film Festival is back on campus, of course. In the next two weeks, from October 16 to 26, UNAFF will screen over 70 documentaries from all over the world, mostly in venues at Stanford and in Palo Alto. For 17 years, the festival has brought films about human rights, environmentalism and social justice to the Bay Area. This year’s theme is “Bridging the Gap,” a celebration of the power of documentaries to collapse distance and inspire dialogue. Here’s a look at some of the festival’s must-sees. Scene from “Broken City Poets.” Courtesy of UNAFF. 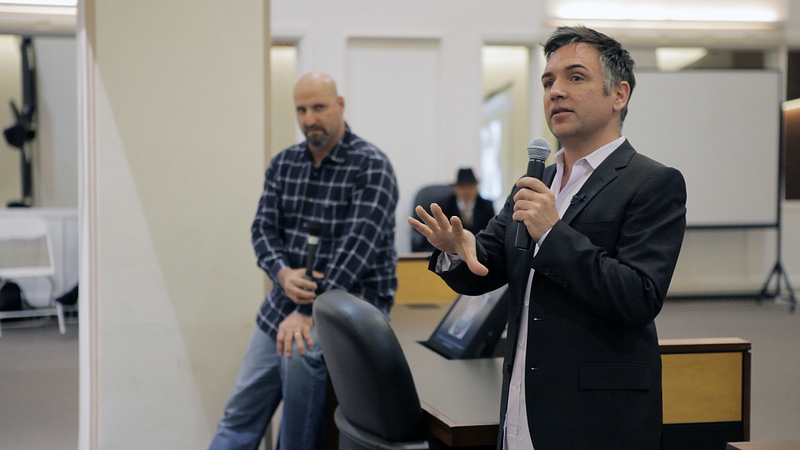 Jason Cohen’s Academy Award-nominated short documentary, “Facing Fear” is about an unlikely friendship. For months, Tim Zaal and Matthew Boger worked together at the Museum of Tolerance before they realized they’d already met: Matthew remembered Tim’s 16-inch Mohawk from a night 25 years ago, when 14 punks attacked him in an alleyway and left him for dead. “Facing Fear” screens Tuesday, Oct. 21, at 4 p.m. in Encina Hall. Scene from “Facing Fear.” Courtesy of UNAFF. In 2013, the Center for Investigative Reporting and Youth Speaks ran a series of poetry workshops for teenagers in Stockton, CA. The students, including Jayda Daniels (stage name “Be Civil”) and Corey Baxter (“Blunt”), were asked to examine their lives through art and journalism. Ariane Wu’s documentary “Broken City Poets” follows these high schoolers through their creative process, as they research their home city, explore poetry, and practice for an all-city spoken word competition. Using footage from the classroom, family interviews and statistics about Stockton, Wu paints a picture of a city devastated by the recession and riddled by gang violence. When “Be Civil” and “Blunt” take the stage, however, they are un-broken and hungry for change. 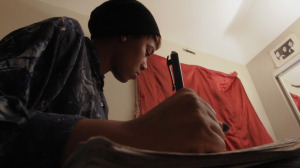 “Broken City Poets” screens Wednesday, Oct. 22, at 4 p.m. in CERAS Room 101. Scene from “The Pad Piper.” Courtesy of UNAFF. Only 12 percent of women in India use sanitary pads or tampons. Most women rely on rags, husks, sand or newspapers, which put them at risk of infection, sterility and cancer. But all this is changing, thanks to Arunachalam Muruganantham, a school dropout turned entrepreneur, who has invented low-cost and biodegradable sanitary pads for women in rural areas. Directed by Akanksha Sood, “The Pad Piper” begins with what Arunachalam calls “a beautiful incident,” the moment he decided to build his wife a safer, more affordable sanitary pad. Since then, he has worked tirelessly, not only to develop new napkin technologies, but also to de-stigmatize menstruation among men and women, alike. In every scene, Arunachalam lights up the screen: he is empathetic but also no-nonsense, willing to confront taboos – and even try on a sanitary pad or two – in order to improve women’s health and wellbeing. “The Pad Piper” screens Saturday, Oct. 18 at 3 p.m. in Annenberg Auditorium. Every day for the next 10 days, Stanford students, faculty and staff have a chance to travel by movie to places near and far (admission is free with a valid ID). In 70 films and seven panel discussions, UNAFF offers moviegoers a round-the-world trip and the chance to learn about topics as wide-ranging as mental health issues in the U.S., dance companies in Rwanda and child soldiers in Mexico. For more information about the festival’s films and panels, please see the UNAFF website.